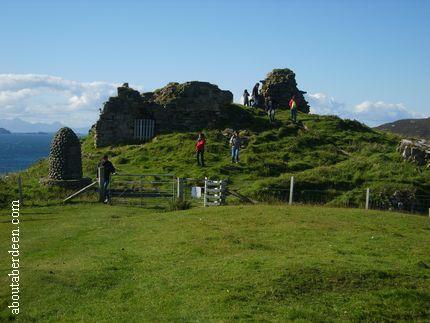 Duntulm Castle can be found on the A855 of the Isle of Skye by Score Bay and in the Trotternish area. For centuries it was the residence of the McDonalds who were known as the Lord of the Isles. 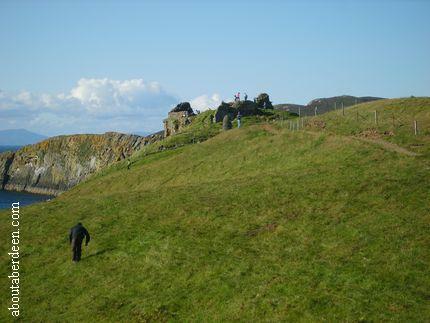 Duntulm Castle is now a ruin with free access and parking by the road side. The ruinous castle is a short walk along the cliffs with some stunning views across Score Bay. 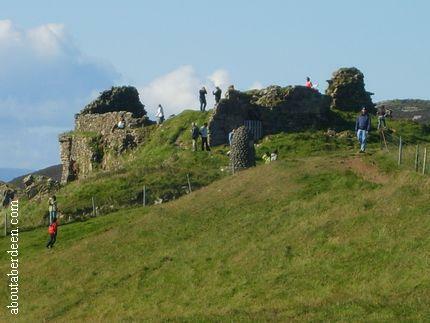 Duntulm Castle is said to be the home of piping (cited in the book Landscapes of the Scottish Highlands and the Isle of Skye by Stephen Whitehorne). A nearby attraction is the Skye Museum Of Island Life whose free car park has a public toilet. The early history of Duntulm Castle saw it used first as an Iron Age Broch (a dry stone hollow walled structure) and then a Pictish Fort. During the Viking invasions they recognised the strategic importance of the area on the Northern peninsula and used it as a stronghold. The first Scottish clan to use the area for a castle, in the 14th century, were the MacLeods. Duntulm Castle was then used by the clan MacDonald until the year 1730. They added a tower in the early 17th century along with a house. 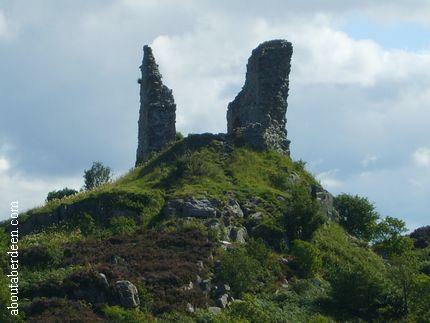 Local legend has it that the McDonalds were forced out of Duntulm Castle by the ghosts. The clan retreated to live at Armadale Castle, though some sources state the Monkstadt House, and left Duntulm Castle to become ruinous. 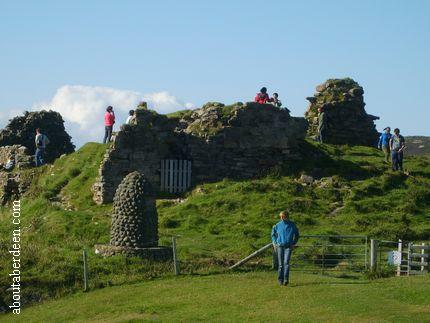 Their settlement in Monkstadt is cited in the book Isles of Skye and Raasay (Landmark Visitors Guide) by Glenn Heritage. Though legends say the ghosts drove the MacDonalds out of Duntulm Castle it was more likely to have been their desire for a more comfortable residence. There are several ghost stories associated with Duntulm Castle. The first of these ghosts is a nursemaid who was charged with the care of a MacDonald baby but accidentally dropped her from a window to the cliffs below. The baby was the son of the clan Chief. As a punishment the nursemaid was cast adrift in the sea on a small boat. It is said that her screams can still be heard. 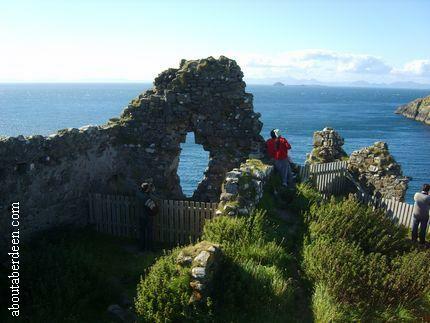 Hugh Macdonald is thought to be one of the other ghosts of Duntulm Castle. Hugh MacDonald was the cousin of Donald Gorm Mor who was the Chief of the McDonald's of Sleat. Hugh planned to kill the Chief but his plans were found out and his own castle was laid siege. Hugh Macdonald escaped dressed as a woman, much like Bonnie Prince Charlie with the help of Flora MacDonald. Though he escaped he was later captured and locked up in DuntulmCastle. He was fed little and was given no water which slowly starved him and drove him mad before dying a lingering death of starvation. Such was his hunger he was said to have tried to eat his own hands. Other haunting screams heard at Duntulm Castle are thought to be from the spirit of Hugh Macdonald. Another unhappy soul to haunt Duntulm Castle is Margaret who lost an eye in an accident and was spurned by her husband and still weeps for her loss. More Ghosts And Ghost Stories Of Scotland. 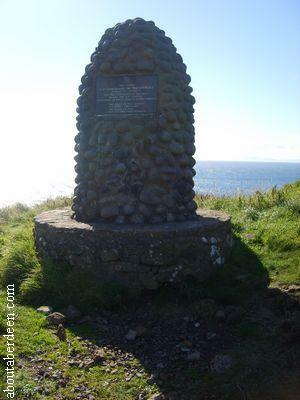 Isle of Skye - general history and overview of the Isle of Skye.